Our events for the season are now over. Please take a look at the events we had this past season! We are looking forward to having more awesome events next year! 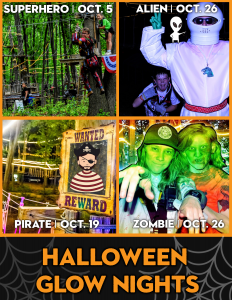 Soar, Zip, and Climb High like a Superhero at our Halloween Themed Glow Night experience. Dress the part, if you wish. You’ll fit right in! Park Superheros will be ready to combat dark forces of the night with you! Fun awaits in the Forest of Gotham. The Park is set aglow with color arches, LED glow tunnels, lasers, and other brilliant decorations. All paid climbers receive glow attire and the glow paint stations are always popular. Superhero attire is encouraged. This is a special event offered at a special price. This is a very popular event that is planned to entertain. Please no capes for climbers. Aliens have been spotted invading the trees at TreeRunner! What normally were staff, you’ll now find friendly aliens guiding on the course, as well as some astronauts who are experts in communicating with the Alien Race. 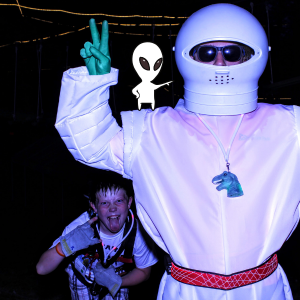 Come dressed in futuristic space attire or alien wear to try to blend in with this new alien race! Best dressed will receive free climbing tickets to return! The Park is set aglow with color arches, LED glow tunnels, lasers, and other brilliant decorations. All paid climbers receive glow attire and the glow paint stations are always popular. This event is very popular and will sell out, so book your tickets ahead of time! Argg Matey! Ye be pirates in the trees! …. Walk th’ plank ‘n climb through th’ trees. Come dressed in yer pirate costumes. Th’ best pirate costumes ‘ave a chance t’ receive free climbin’ tickets fer a future climb. Th’ Park be set aglow wit’ color arches ‘n LED glow tunnels. 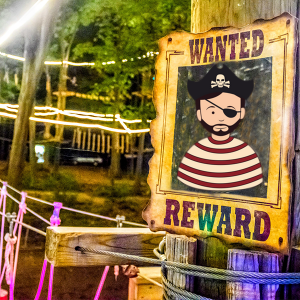 All paid climbers will receive glow attire ‘n our glow paint stations are always popular. Book yer tickets ahead o’ time! A Zombie Outbreak is happening at TreeRunner! This event is very popular and spots fill up fast so make sure to reserve your spot in advance. The Park is set aglow with color arches, LED sequence lighting, lasers and other brilliant fares. All paid climbers receive glow attire and glow paint stations are always popular. Find the doctor trying to combat the Zombie Outbreak for scheduled trivia for a chance to win free climbing tickets. Guests are encouraged to arrive in their preferred zombie attire. Makeup is appropriate for this event. 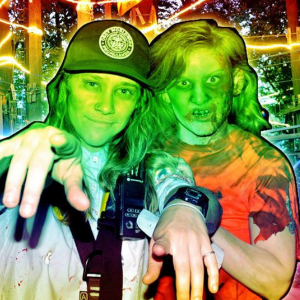 Best dressed, scariest and most family-friendly zombies will be awarded free tickets for this event. Climb through the trees under the spectacular lights and experience the park like never before. This event starts at 5:30 PM every Thursday, Friday, and Saturday night! This event was wildly popular last year, so you’ll definitely want to get your tickets early for this one.